The first half of this week’s action ran yesterday, so if you missed out on that, feel free clicking here. The final seven games of Week 9 will commence…right about now. Scott Norwood kicked a game-tying 20-yard field goal with a second remaining in the fourth quarter and then added a 51-yarder as time expired in overtime to give the Bills a come-from-behind home victory. Thurman Thomas ran for 121 yards on 27 attempts for Buffalo and Jim Kelly went 16-of-26 for 187 yards and a touchdown. Johnny Unitas hit a number of big plays, going 13-of-21 for 211 yards and a touchdown for the Colts, who had a chance to win the game in overtime but Steve Myhra’s 48-yard field goal attempt with a little over a minute remaining was no good. The Bills were then able to drive 35 yards in that time span to set up Norwood for the game-winning attempt (and we all know he’s been so money on those in the past, so there was never any reason to doubt him). Aided by a Bart Starr touchdown throw to Boyd Dowler and a 32-yard touchdown run by Max McGee, the Packers jumped out to a 17-0 lead on the Broncos and rendered Denver’s fast finish moot, advancing their record to an NFC-leading 7-1. McGee also had 67 yards receiving for the Packers and Jerry Kramer added four field goal attempts. The Broncos were held scoreless until the fourth quarter when Rod Smith and Terrell Davis both scored on long touchdown runs and could never get closer than a ten-point deficit in the second half. Marshall Faulk had 175 combined rushing and receiving yards and a touchdown on 22 touches and Jeff Wilkins kicked three field goals in the fourth quarter to make Bengals backup Turk Schonert’s successful Hail Mary to Dan Ross on the final play of the game meaningless. Kurt Warner went 16-of-25 for 188 yards and two touchdowns for the Rams, who took a 30-24 lead with 1:52 remaining in the fourth quarter. Ken Anderson threw for 287 yards and two touchdowns on 36 attempts but could only manage three incompletions and a six-yard run on Cincinnati’s last ditch effort, setting up Wilkins’ game-clinching 37-yard attempt with 35 seconds left. Dan Fouts threw for 248 yards and a touchdown on 25 attempts and the Chargers’ defense held Mark Brunell to a miserable 13-of-32 for 145 yards as San Diego moved to 7-1 on the season. Cliff Thrift had two sacks of Brunell, who avoided turning the ball over but couldn’t lead the Jaguars to any points other than a first quarter Mike Hollis field goal. Charlie Joiner, Bob Klein and John Jefferson all finished with over 50 yards receiving for San Diego. 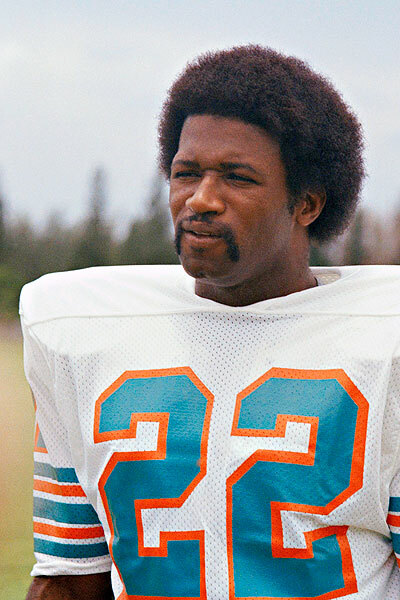 Mercury Morris and Larry Csonka punished the Oilers’ run defense, combining for 243 yards and five touchdowns on just 34 attempts as the Dolphins won their third in a row and handed the Oilers their third loss in a row in the process. For the first time all season, Miami also got excellent play from the quarterback position, as Bob Griese went 11-of-15 for 170 yards and a touchdown and the Dolphins wound up with 466 total yards of offense. Allen Pinkett had a sensational day himself in a losing effort, rushing for 166 yards and a touchdown on just 14 carries. The Redskins gained seven more first downs than the Cowboys (22-15) and gained 31 more total yards on offense (364-333), but three missed Chip Lohmiller field goals in the first half helped the Cowboys jump out to a 17-0 advantage that the Redskins ultimately couldn’t overcome. As a result, Dallas moved into sole possession of first place in the NFC East with the road victory at RFK Stadium. Emmitt Smith rushed for 132 yards and a touchdown on 22 attempts for Dallas and Troy Aikman added 172 yards and a touchdown on 19 pass attempts. Mark Rypien threw for 238 yards and two touchdowns on 34 attempts for Washington, but the Redskins consistently bogged down around the Dallas 35-yard line in the first half, leading to long field goal attempts (and misses) of 50, 49 and 50 yards from Lohmiller. Terry Bradshaw was a magnificent 19-of-24 for 278 yards and three touchdowns and the Steelers buried the Browns with 34 unanswered points after falling behind 10-7 early on. Franco Harris added 120 rushing yards and a receiving touchdown for Pittsburgh, whose lead in the AFC North ballooned to two games in conjunction with Cincinnati’s loss. Jim Brown ran for 114 yards and a touchdown on only 14 carries, but Frank Ryan was absolutely horrendous trying to bring the Browns back, going only 9-of-25 for 57 yards. Next week: Vince Lombardi gets his first crack at the Purple People Eaters’ defense, the ’92 Cowboys and ’86 Giants have their final meeting of the year and the ’85 Bears and ’79 Chargers meet in a matchup of teams with just three combined losses.